The human body is soft, warm and vulnerable. An abandoned industrial site is hard, cold and unyielding. 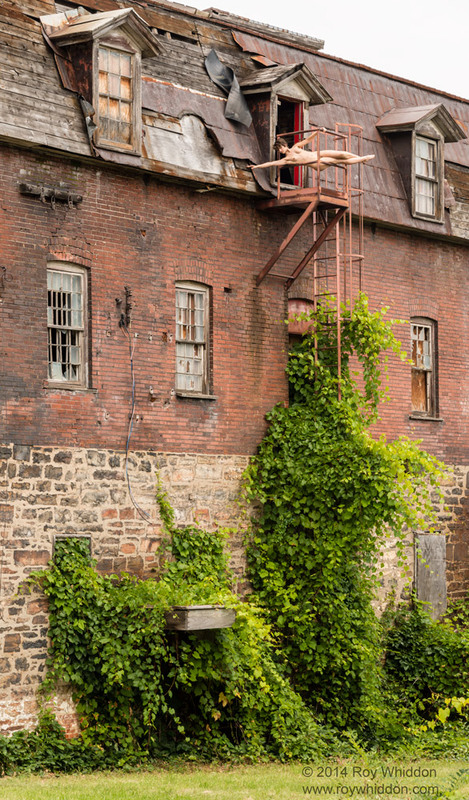 Over a period of four years, with the owner's permission, I have photographed models at the old Howard Smith paper mill in Beauharnois, Québec. The figures interact with the harsh environment in a variety of ways, sometimes succumbing to its power, sometimes actively engaging and sometimes exploring playfully. The contrast between naked flesh and the decaying machinery allows me to explore themes of alienation, oppression and vulnerability on the one hand; freedom, resiliency and rebellion on the other. Half of the mill was destroyed by fire in 2012, and many of the photographs could not be created today because the setting no longer exists.